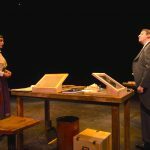 A Michigan Tech student was recognized by the Kennedy Center American College Theatre Festival (KCACTF). 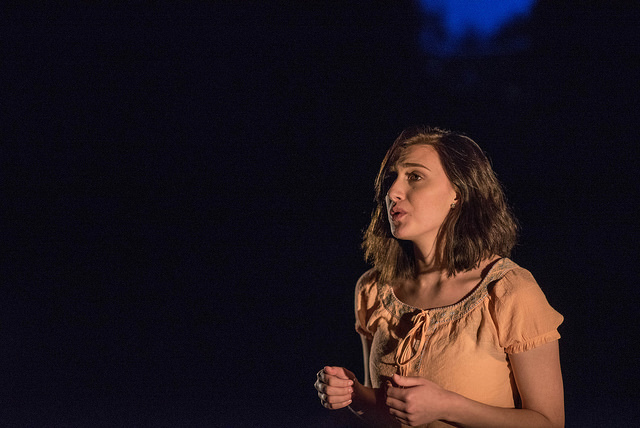 As a result of eight regional festivals held in January and February, theatre students from around the country have been recognized for outstanding works. 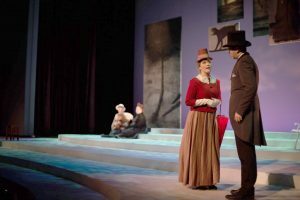 The Rozsa Center, Department of Visual and Performing Arts and the Tech Theatre Company present the VPA 25th Anniversary Season theatre finale, “Sunday in the Park with George,” Thursday, Friday and Saturday (April 11-13) at the Rozsa Center for the Performing Arts. Curtain time is 7:30 p.m. each evening. The musical features junior computer science major Jonah Schulte as George One and George Two. Katy Gula, a junior environmental engineering major, plays the role of Dot. “Sunday in the Park with George” is a fully staged musical with live orchestra. Stephen Sondheim and James Lapine’s lyrical celebration of art, love and children merges image, music and performance to explore the depths of human understanding. Winner of the Pulitzer Prize and staged around the world, “Sunday in the Park with George” explains the simple essence of life we can all understand. Tickets are on sale now, $19 for adults, $6 for youth, and no charge for Michigan Tech students with the Experience Tech fee. Tickets are available by phone at 7-2073, through the date links (Thursday, Friday and Saturday) , in person at the Central Ticketing Office in the Student Development Complex or at the Rozsa Box Office the night of the show. The box office opens two hours prior to the performance. 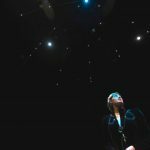 Described as a “visual poem, using no words,” Air Play will perform at 7:30 p.m. Saturday, March 23 at the Rozsa Center for the Performing Arts. This fun-for-all ages circus-style event includes flying umbrellas, larger-than-life balloons, giant kites floating over the audience and the biggest snow globe you’ve ever seen. Air Play brings to life the very air we breathe. The circus-style adventure follows two siblings’ journey through a surreal wold, transforming ordinary objects in uncommon beauty. Fabrics dance in the wind, balloons have a mind of their own, confetti turns into the night sky and an enormous canopy of hovering silk forever alters their future. Tickets for Air Play are on sale now at $16 for adults, $6 for youth and free for Michigan Tech students with the Experience Tech Fee. Tickets can be purchased online, in person at the Central Ticketing Office in the SDC, by phone at 487-2073 or at the Rozsa Center Box Office the evening of the performance. Note: The box office opens two hours prior to the start of the show. Questions of faith, motherhood and determination arise as three women with vastly different ideologies are faced with a supposed virgin birth. The Department of Visual and Performing Arts, presents six performances of “Agnes of God,” tomorrow through Saturday (Feb. 21 – 23 ) and Feb. 28 to March 2. Performances are at 7:30 p.m. in the McArdle Theatre on the second floor of the Walker Arts and Humanities Center. Pielmeier’s dramatic script poses challenging questions for its three characters — Dr. Livingstone, an atheistic psychiatrist, the pius Mother Superior and young Sister Agnes, mother of the deceased child she claims to have immaculately conceived. The cast of three experienced performers is directed by Patricia Helsel (VPA). Tickets are on sale now, $15 for adults, $5 for youth and no charge for Michigan Tech students with the Experience Tech fee. 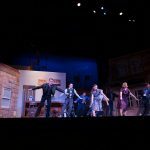 Tickets are available by phone at 906-487-2073, online, in person at the Central Ticketing Office in the Student Development Complex or one hour prior to show time at the McArdle Theatre the night of each performance. The Rozsa Center for the Performing Arts presents Les Ballets Trockadero de Monte Carlo. The all-male comedy ballet company, beloved internationally since 1974, sacrifices comfort to perform en pointe, tutus and all. Confirming why audiences flock to see them year after year. The “trocks” are witty , fun and above all, masterful in the art of ballet. The Les Ballets Trockadero De Monte Carlo is performing at the Rozsa Center at 7:30 p.m. Saturday, Feb. 16. This event is made possible with support from WGGL Minnesota Public Radio, Keweenaw Pride, and with funding from the Michigan Humanities Council — an affiliate of the National Endowment for the Humanities and the Arts Midwest Touring fund, a Program of Arts Midwest, generously supported by the National Endowment for the Arts with additional contributions from the Michigan Council for Arts and Cultural Affairs and the Crane Group. Tickets for adults are $28 and youth $12. Michigan Tech Students are no charge with the Experience Tech Fee. Tickets are available by phone at 487-2073, online, in person at the Central Ticketing Office in the Student Development Complex, or at the Rozsa box office the night of the show. Note: the Rozsa box office opens two hours before performances. 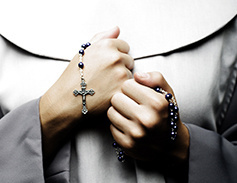 Auditions for Agnes of God will be held this evening, Wednesday, November 28th at 7:00 pm. in Walker 210. Mother Miriam Ruth — Actor able to play 40-60 yrs. old. Devout. Became a nun after having a family. Wants to keep peace and (possibly) save face for the religious order. Sincerely has Agnes’ best interests in mind as she tries to protect her from jail or the asylum. Dr. Martha Livingstone — Psychiatrist, (Actor able to play 40-60 yrs. old) She’s seen it all. While she has a tough exterior, she struggles with personal demons. Still, she is quite compassionate. A chain smoker. Agnes — Novice who denies giving birth. Innocent. Sings like an angel. She was abused by her mother and is forced to face this reality at the show’s climax. No preparation is necessary, but scripts are available to check out in the office of Visual and Performing Arts. The audition will be cold readings from the script. Rehearsals will be next semester, with performances February 21-23, Feb 28-Mar 2. It’s not typical for a person to study Theatre and Electronic Media Performance at a university more known for engineering. 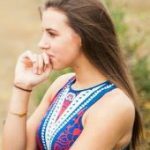 As I thought about my education at Michigan Tech and this unique program, that not many people pursue in the Upper Peninsula, I realized how extraordinary my college adventure would be. I am a fourth-year Theatre and Electronic Media Performance major, minoring in Technical Theatre, and my name is Callisto Cortez. Over the years I’ve fallen in love with my department and the people that have become some of my closest friends. The tight-knit community that is the Visual and Performing Arts department works as a family and all the students can get one-on-one discussions and attention from each of our professors. Within my first year and a half at Michigan Tech, I was able to complete my Acting Practicums. Each practicum was worth 1 credit, which means I had already acted in 3 productions with the Tech Theatre. It’s been an incredible learning experience, for the fact that I was able to immerse myself in the program right away. By the first semester of my second year, I was cast in my first leading role for the Tech Theatre, Silent Sky. I have realized how extremely passionate I am about theatre and how fortunate I am to make my dreams into a reality by making my hard work pay off. The major of Theatre and Electronic Media Performance at Michigan Tech caters to each student individually as artists. At first, my mindset was focused primarily on performance and enhancing my acting abilities. Then, I discovered my love for the technical aspects of theatre as well, which lead me to taking technical theatre courses. My second year, I helped to paint an entire set for The Irresistible Rise of Arturo Ui, and also stage manage the production of Sexual Perversity in Chicago During these two semesters, I was the lead in Silent Sky for the Fall semester and a dancer in West Side Story spring semester. Now, I want to be able to act in a show, stage manage another, assist in any type of design, and just get to know the people who make an entire production happen. 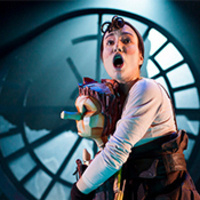 The Rozsa Center welcomes the acclaimed theater troupe Tout à Trac, from Quebec, Canada, with their adaptation of “Pinocchio,” a magical theatrical production which takes us on another amazing journey into the heart of childhood and imagination. 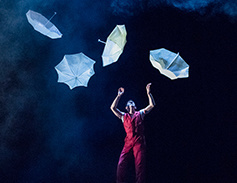 Following their internationally acclaimed “Alice in Wonderland,” Tout à Trac returns with Collodi’s tale about the world’s most famous puppet: Pinocchio. They will present two shows —2 and 7:30 p.m. Saturday (Nov. 10). In addition to the performance, guests at the 2 p.m. matinee will be treated to “KC Bonker’s Gepetto’s Workshop” in the lobby, after the show, co-hosted by Trish Helsel (VPA), KC Bonker’s, the Portage Lake District Library and the Rozsa Center. “Gepetto’s Workshop” will include an interactive puppet workshop, featuring an on-stage tour of the Pinocchio set, a shadow puppet theatre and a “sock-puppet creation-station” in the Rozsa lobby, complete with refreshments and puppetry-themed fun for all ages. Tickets are on sale now, $16 for adults, $6 for youth and no charge for Michigan Tech students with the Experience Tech fee. Tickets are available by phone at 7-2073, online at mtu.edu/rozsa, in person at the Central Ticketing Office in the Student Development Complex or at the Rozsa Box Office the evening of the performance. Note: The Rozsa Box Office only opens two hours prior to performances.